The ripened sheep’s cheese is a product without further processing; it can be consumed by the general population, except for medical contraindications. When the ripening is not prolonged, it possesses a sheep’s typical aroma, ripened in a controlled environment and with a slightly acidulous taste. It presents a thin yellow crust and a soft, buttery paste on the inside. When the ripening is extended, it possesses a moderately stronger flavor, given by the prolonged ripening. It presents a hard yellow crust and a hard paste on the inside. 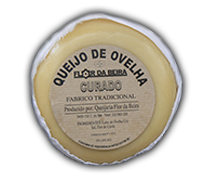 Produced with the whey from the manufacture of the ripened cheese, it presents a soft ivory white paste with a slightly acidulous taste and a sheep’s typical aroma. It is usually produced without further processing, and it can also be consumed by the general population, except for medical contraindications. Moderately strong flavor, given by the prolonged ripening..